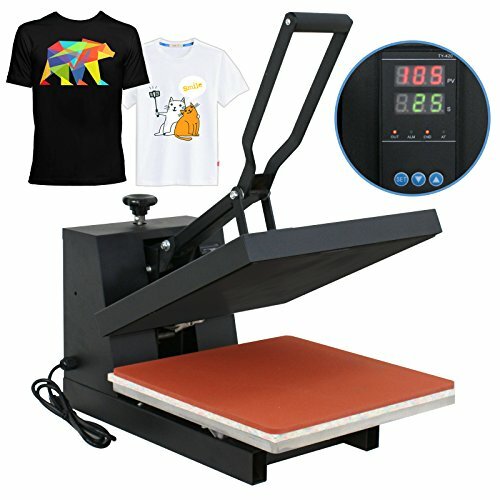 SUPER DEAL 15" x 15" clamshell heat press gives you a large area for t-shirt and fabric heat transferring. Clamshell heat presses save room over the standard swing arm heat presses, and can be easier to manage depending on the set up of your workspace. Aluminum heat plate, Heating uniformity on the surface, Digital LCD Temperature & Time Control. Temperature Range :0~ 250°C;Time Range:0~ 9999 second, Printing Area:38* 38cm, Working table: 15" x 15"
Teflon coated on the heat plate. Energy-saving Heating Board: The heating tube and heating board are together, which will quick to heat up, reduce energy waste and distribute temperature evenly. Signal indicator when transfer press over . Sound Alarms: Green light shines to indicate reach of preset temp; Alarms when heat pressing is finished. Non-Stick Design: Equipped with heat-resistant glassfiber to prevent damage of clothes and mucosity.